There are not a lot of positives to take from the Kansas City Royals season. The Royals sit in last place of the American League Central with a record of 52-76, 17 games behind the Detroit Tigers for first place. Kansas City looks destined to finish with a losing record for the eighth consecutive season. They are the only American League team that has not had a winning streak of longer than four games all year. However, for a franchise that has not made the playoffs since it won the World Series in 1985, there are some bright spots to take from this season. It is widely believed that the Royals’ farm system is the deepest and most talent-laden in all of baseball. The parade of young players who represent Kansas City’s future has begun this year. Five prospects who have been ranked in Baseball America’s Top 70 minor league prospects are seeing significant time in their first season as Royals. 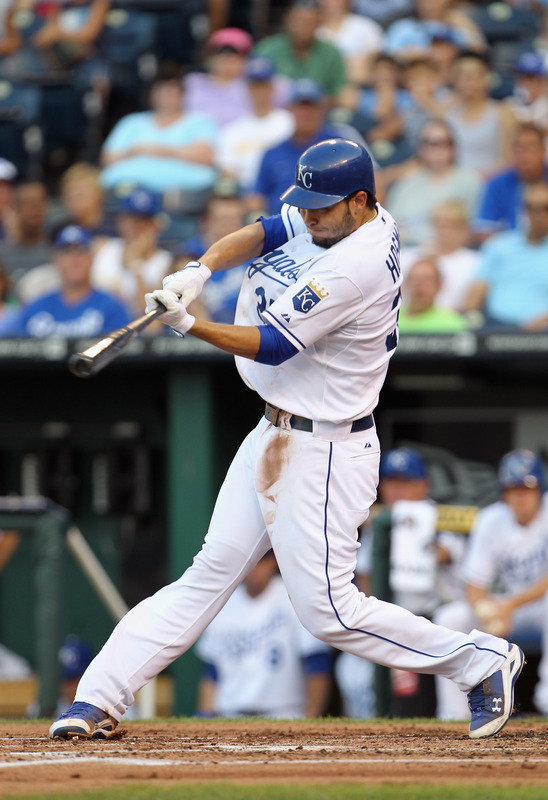 Twenty-one year old first baseman Eric Hosmer (No. 8 in 2011), 22-year old third baseman Mike Moustakas (No. 9 in 2011) and 24-year old shortstop Alcides Escobar (No. 12 in 2010) figure to be playing together in Kansas City’s infield for a long time behind pitchers Danny Duffy (No. 68 in 2011) and Aaron Crow (No. 40 in 2010). 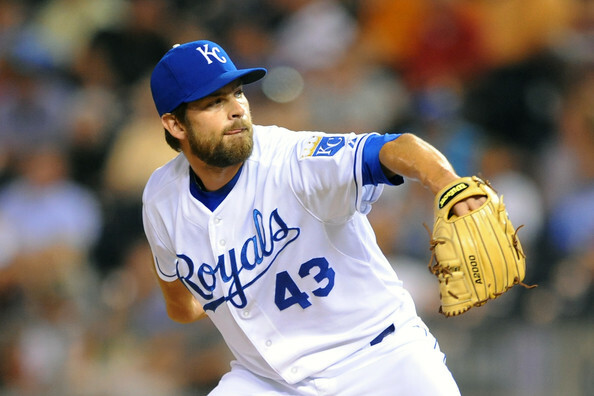 The Royals have allowed these players to take their lumps and develop at the major league level as they prepare to not contend for the postseason in 2011, but in 2013. Because of that, most of them have struggled so far. Hosmer is batting .268/.320/.416 with 20 doubles, 10 home runs and 53 runs batted in in 94 games. Moustakas is hitting just .206/.262/.262 with nine doubles, one homer and 13 RBIs in 58 games. Escobar, who played as a rookie with the Milwaukee Brewers last season and was part of the Zack Greinke trade, has a batting line of .250/.285/.331 with 18 doubles, six triples, two home runs and 37 RBIs in 127 games and has also played spectacular defense at arguably the most important position on the field. Duffy has shown signs of his potential, striking out 7.3 batters per nine innings, but in 17 starts is 3-8 with a 5.48 ERA and 1.647 WHIP in 88.2 innings, due essentially to allowing 10.5 hits and 4.4 walks per nine innings. The Royals believe that while these players will be able to adjust to a major league level of baseball and become cornerstones the team can build around with much of their talent still in the minors. The only one of the five who has had a very good all-around season is Crow, who was an All-Star out of the bullpen. He has appeared in 49 games with a record of 3-3. He has an ERA of 2.41, a WHIP of 1.286 and has 56 strikeouts in 56 innings of work. Crow was a starter in college at Missouri and in the minor leagues before making the major league club as a reliever this season. However, he struggled as a starter in the minors, going 12-10 in 32 starts with a 5.26 ERA, 1.450 WHIP and 160 strikeouts in 180.1 innings pitched over two seasons. It remains to be seen if the Royals will decide to make him a part of the rotation in the future and if they do, if Crow can be effective in that role in the major leagues. If he can translate his success in the bullpen to the starting rotation, the Royals will have a top-of-the-line pitcher on their hands. While Crow, Duffy, Moustakas, Hosmer and Escobar are all in their first seasons in Kansas City, it is another former big-time prospect who has suddenly re-established himself as part of the Royals’ future plans. 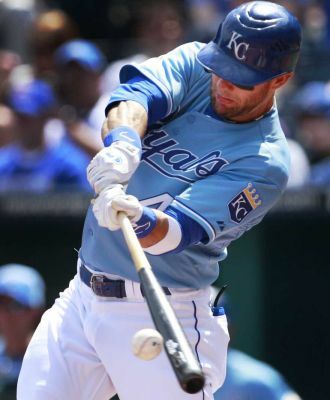 Alex Gordon, the second overall pick of the 2005 amateur draft, was ranked the No. 2 overall prospect by Baseball America before his rookie 2007 season. From 2007 through 2010, Gordon did not live up to the hype, never hitting better than .260 in a season. He batted .244/.328/.405 with 87 doubles, 45 home runs and 161 RBIs in 408 games over those four seasons. To put that in perspective, he averaged just 22 doubles, 11 homers and 40 RBIs each season. In 2011 though, Gordon has displayed the tools that once made him a can’t-miss prospect. He is hitting .297/.369/.487 with 39 doubles, 16 home runs and 67 RBIs in 123 games, all career-highs. The 27-year old outfielder is finally healthy and is an example to Kansas City of why they should not give up on any prospects who struggle initially in the minor leagues. Now entering his prime, Gordon looks to be a bat in the middle of the lineup along with Hosmer, Moustakas and 25-year old slugging designated hitter Billy Butler (.293/.370/.456, 30 doubles, 15 home runs, 70 RBIs) that the Royals can build their lineup around with all of their young talent still developing down on the farm. The Kansas City Royals are almost certain of a last-place finish in the AL Central and an eighth consecutive losing season. However, looking past that, there are some positives to take from this season. The Royals are finally starting to see some of the talent that oozes in its farm system playing in the big leagues. Aaron Crow, Danny Duffy, Eric Hosmer, Mike Moustakas and Alcides Escobar only represent the beginning of what should be a continuous parade of the minor league’s most talented players to Kansas City. Combined with the resurgent Alex Gordon and one of the majors’ most underrated hitters in Billy Butler, and the Royals have an impressive young nucleus that the team hopes can contend in 2013. Kansas City hasn’t made the playoffs since winning the 1985 World Series, but the foundation is now in place for a run in the future.